Looking for a quick, nutritious side dish for your turkey dinner? Cranberry Relish! So simple and quick, it comes together in a few moments. Being one of the native North American fruits, some claim cranberries must have been on the dinner cuisine at the pilgrim’s first Thanksgiving. Canned cranberry jelly has been a staple at Thanksgiving dinner since 1912. The jelled sauce was a standard in my house until I found my mother’s recipe for fresh cranberry relish. Cranberries are Good for You! Full of nutrients, cranberries are one of the healthiest side dishes you can make at only 46 calories a cup. According to medicalnewstoday.com, the nutrients in cranberries have been linked to a lower risk of urinary tract infections, prevention of certain types of cancer, improved immune function, and decreased blood pressure. Does anyone remember the old-fashioned grinders? 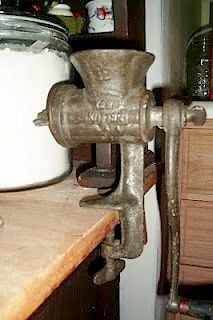 My mother used to grind her cranberries and fruits with this handy-dandy appliance after clamping it onto the cupboard. Now, the food processor does a lovely job. 1. Wash cranberries, picking out any that are spoiled or too soft. 2. Peel orange and apple. 3. Put each fruit through the food processor (or grinder, if you are adventurous) and chop into tiny pieces. 4. Add one cup of sugar to the mixture. 5. Add nuts and combine well. 6. Store in refrigerator until ready to eat. This recipe will keep up to one week in the refrigerator. Add miniature marshmallows and whipped cream for a wonderful side dish – FRESH, for goodness sake!